1) The comment should not be spam. 2) Any comment below 10 words will not be considered. 3) Comment should be relevant to the topic. 4) Hatred or abuse is strictly prohibited. 5) Respect each others comments. 6) Do not respond to or start a flame war. 7) Comments should not be repeated with same text and info. 8) The top commentator should have minimum 20 comments to qualify. You can check out your comments score at the bottom of the site, and also we will update the information every week in our Facebook groups and pages. 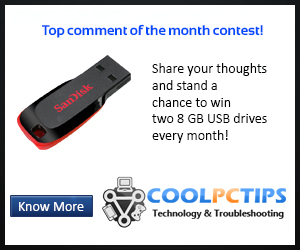 The top commentator will be announced on the last day of month and will be sent a 8GB USB drive ASAP via courier. Comments on any article are eligible for consideration. This is really a good contest to engage with co-bloggers and the readers. And one more advantage is we can even turn visitors to regular visitors. I just bookmarked this blog to gain some useful knowledge.